From the beginning, Pope Francis has led through both word and example, guiding Catholics—and the rest of the world—to the basic principles of love and compassion that Jesus taught. The day before Pope Francis’s meeting with President Obama earlier this year, 10-year old Jersey Vargas from Los Angeles, CA rushed up to the pontiff as he greeted the throngs in St. Peter’s Square. She told him about the plight of undocumented migrants in the U.S., and the pain of being separated from one’s family during the detention and deportation process. 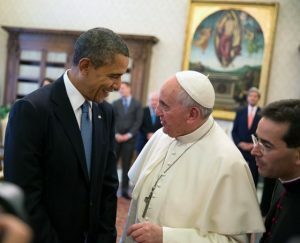 Pope Francis with President Barack Obama, March 2014. Public domain image from Wiki Commons, photo by Pete Souza. 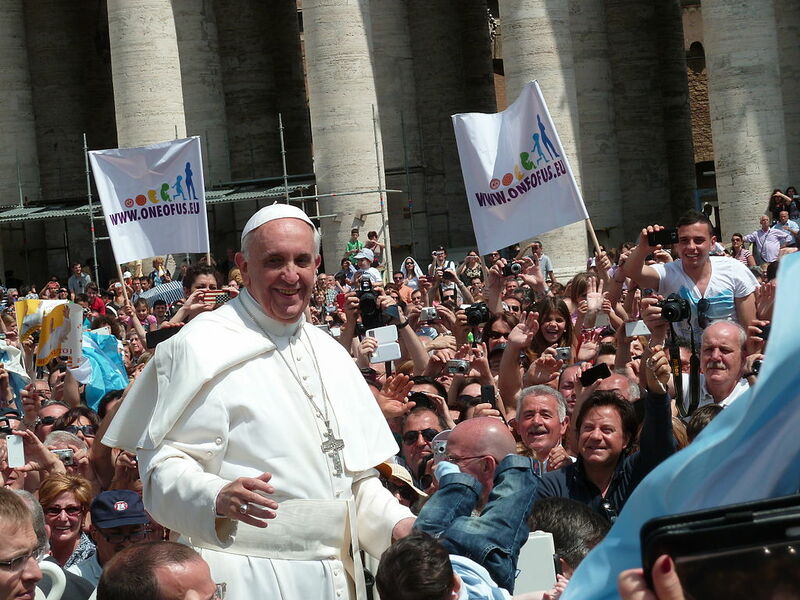 Pope Francis among the people of St. Peter’s Square in Rome, May 2013. Public domain image from Wiki Commons, photo by Edgar Jiménez. Only eight square miles, Lampedusa functions as something of an unofficial Ellis Island for Europe, though the African migrants who pass through, like their Latin American counterparts entering the United States, lack what immigrants arriving in New York could rely on a century ago—a comprehensive and welcoming immigration policy that provides a legal route to citizenship. Today’s migrants leave their homes of origin to follow much the same dreams as those Ellis Island entrants; they want to improve their lives and those of their families. Sometimes they are joining family members, sometimes they are fleeing violence, but always it is a serious decision to undertake such a journey. Migrants from both Africa and Latin America face numerous hazards (choppy seas or harsh desert terrain) as well as risks of exploitation, violence or death. In 2012, close to 500 Africans drowned en route to Europe, despite the Italian coast guard’s conscientious responses to calls for help, distressingly similar to the migrant death toll of 477 here. The Pope’s main agenda is three-fold: to draw attention to the suffering of migrants and refugees, the horrors of human trafficking, and the pervasive problem of poverty. The high profile nature of his office provides one of the most prominent “pulpits” in the world, yet the great moral force of his words comes from something very basic—his example of humility and his simple message of compassion and love. In this, Francis has not only captured the minds and hearts of Catholics, but of a wider world of people who are troubled by the inequities and injustices around us. Much has been made of Pope Francis’s rejection of extravagance in his day-to-day life and on his overseas visits. (In Lampedusa, he rode in an open-top Fiat jeep loaned by a Milanese family with a summer house on the island.) Journalists seem surprised and amused by the absence of designer footwear, for example. But this particular sartorial choice resonates powerfully with the displaced peoples he champions, roaming the world with little more than the clothes on their backs. Their shoes are worn through, often held together with duct tape or reinforced at the soles with carpet remnants, as they tread long miles and endure life-threatening conditions, to seek a better life. 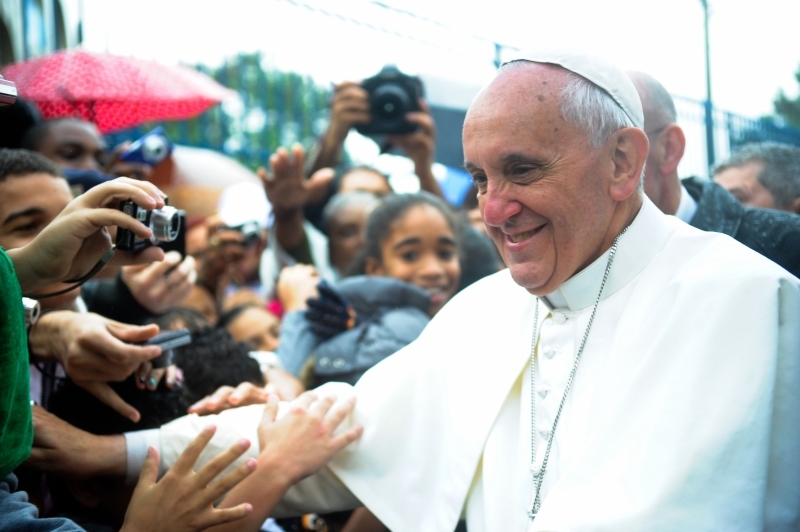 Pope Francis, welcomed by a crowd in Vargihna, Brazil, July 2013. Public domain image from Wiki Commons, photo by Tânia Rêgo. 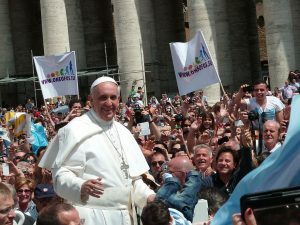 By removing the pomp, Pope Francis has cut through to the heart of the seemingly impenetrable problems of our day, without any embellishment or comfort for the comfortable. “We are a society which has forgotten how to weep, how to experience compassion—‘suffering with’ others. The globalization of indifference has taken from us the ability to weep.” Who better than the Pope to remind us of the word’s Latin roots: “compassion” from com/with and pati/to bear. The simple message of economic justice and tolerance is getting through. President Obama quoted Pope Francis when addressing the debate about income inequality in December. And politicians in Washington, D.C., are also invoking the Pope’s sentiments as they consider the critical issue of immigration reform. Change—or at least a push for a House vote on immigration legislation passed by the Senate last year—appears to be in the air. For one Los Angeles family, a small change has made a great impact. Mario Vargas was released from the detention center after a cousin, seeing Jersey interviewed on the news, helped with posting his $5,000 bail. An immigration judge will determine if Mario is to be deported. For now, he is reunited with his wife and daughter and, though the future is uncertain, Mario—and millions of people around the globe seeking refuge and legal recognition—have the most steadfast of friends and an eloquent spokesperson in Vatican City.